craftyblossom: a quilt for harry. This is a quilt for a baby named Harry. Harry's parents are both graphic designers. In the hopes that his cool parents would like it. They are going to love it. I do. They will! It's a great quilt. such awesome quilt for a very cool baby! totally.rad. i adore it, both colors and design! Gorgeous. If they don't like it I'll gladly adopt it! They will. It's beautiful in its simplicity, and it has a fabulous graphic quality. I absolutely love this quilts....the colours are amazing together. I love love love this. Love. love the colours and the limited palette and the simplicity of the design.. If they don't like this, they're not cool. Very cool and artsy! They will love it! Lucky Harry! It's a beautiful quilt and his parents are sure to appreciate and love it. how could they not love it?! that is a COOL quilt! love the colors so much! Dear E... I LOVE my quilt and I will keep it forever and ever. I am pretty sure my mom loves it more though because she walks around the house 'draping' it over random chairs and couches. It makes her happy when she looks at it in our house. It's perfect, thank you! It's the best gift we have ever received! Hugs and Kisses, -Baby Harry. this is one fantastic design! I love this quilt. It is so great. 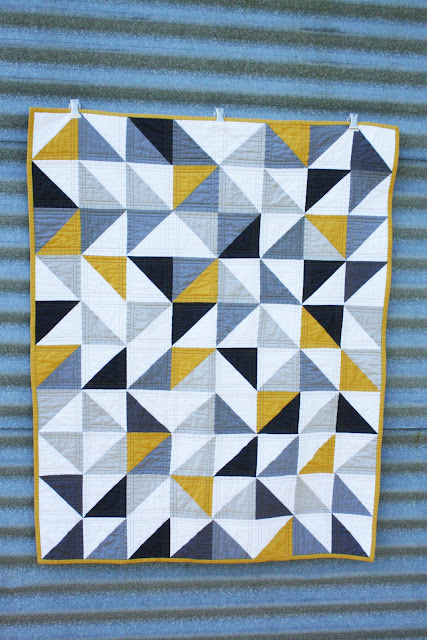 I am kind of making a quilt similar to this, but I wish I had thought of using the gorgeous gold color! i truly love this blanket. it looks awesome. did it take forever to make? it looks like it would cost a fortune off the shelf..
Love it! What great colors and sleek design. I love that quilt! Half square triangles are so adaptable. And magnetic clips to hang and photograph it?! That's just what I need! Not liking it- Not possible!!! Uber cool indeed!! What a great quilt & fantastic stitching! Just saw this beauty on MDQ site!! Awesome!! the quilt is gorgeous. now pray tell, where did you get that ladder?! I love it! This quilt is amazing...great colors, so graphic! Amazing - I LOVE IT! This is such a beautiful quilt! Is there - by any chance - a tutorial available somewhere? beautiful! I love your colour selection. 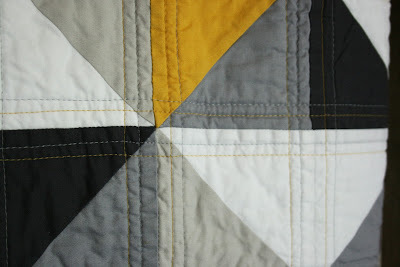 I've got a half square triangle quilt cut out for our little man too. I'm a graphic designer and love it! so gorgeous! i love the colors you used. Well I don't know what Harry's folks thought of it but I LOVE IT!!! This is amazing. I would love to "pin" it to my pinterest board for inspiration but I see that you prefer we don't? I will add your blog to my reader. Thanks! OMGosh! I love this! Must make it now. 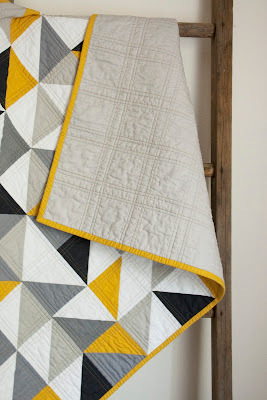 My husband and I are both designers and we would flip for this quilt for sure!! Awesome baby quilt! I love the colour combination. What a beautiful quilt!! I'd like to make this too....can you tell mme what size squares you used? love the judicious use of solids and the harmony in your top stitches. most excellent. I saw this on Pinterest and LOVED it. I'll ask the question from above again-- Is there a tutorial or a pattern? Pretty please??? I love it! I'm in love with gray and yellow together, this is so pretty! I don't know how to make a quilt and am now a little sad I can't buy this. :( love it! I love this quilt. And I have customers who would love it too, I am sure. Do you perhaps have an Etsy or daWanda-Shop, where you sell your wonderful work? Love the triangles and love the colours. Beautiful! This is such a gorgeous quilt: modern with wonderful colours. I just love the colour combination - inspired, I think. I'm sure Harry's parents will love it too. This is beautiful! Where can I find the directions? 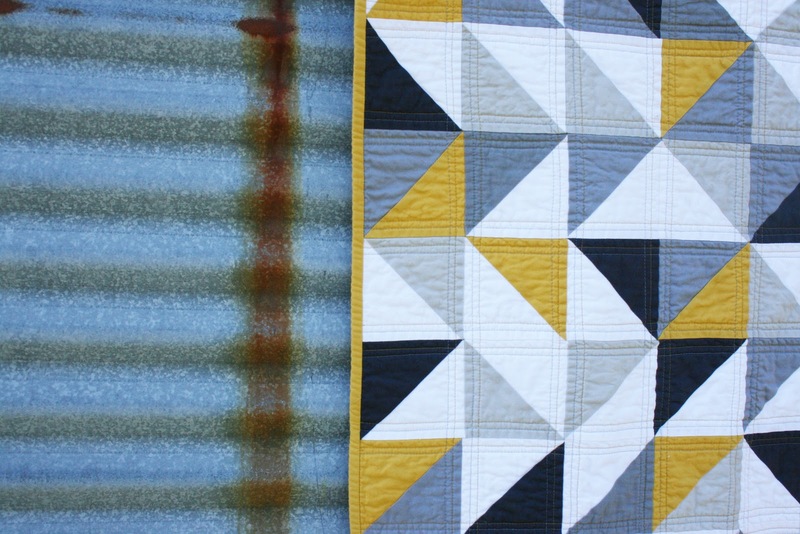 Your half triangle quilts are beautiful. I'm going to working with my grandmother to make a couple for my boys. She needs a pattern to work with. Do you have any suggestions? Mind sharing the dimensions of your finished blocks? Any info would be great. Thank you for the inspiration and sharing your gorgeous quilts! 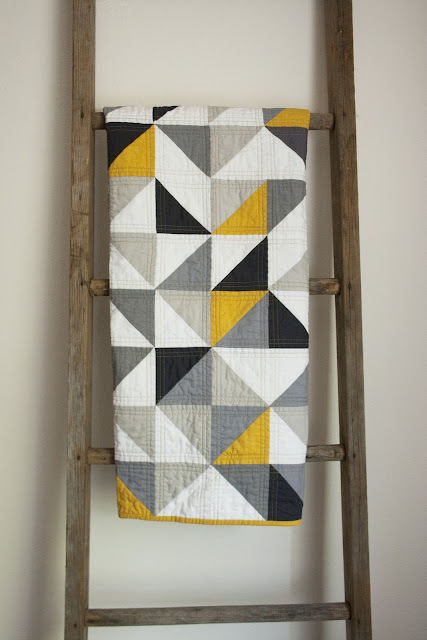 Where is the quilt pattern from/who is it made by? Love it and would love to buy it for my mother and make it! Thanks. i've been eyeing this quite for a while now, but as someone who is new to sewing and never made a quilt I was hoping you would post with some basic tips on sizes, etc? thanks! Can you share the names of your fabric colors? Your color sense blows me away. I could look at this and some of the similar quilts all day long. Absolutely beautiful in design, color, and proportion. I love this quilt. Is there a tutorial available? 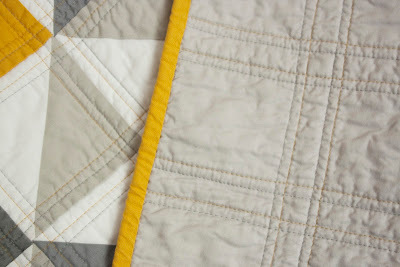 I know that this quilt was from forever ago (in blog time) but I am wondering if you recall which colors you use a dear friend is interested in a quilt similar to this one and LOVES the colors. Hi! 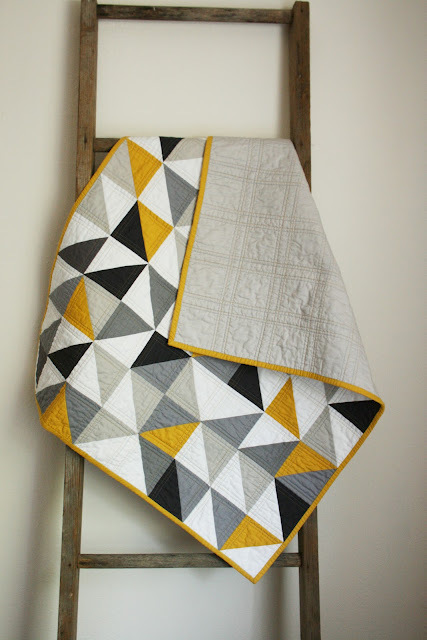 I saw your quilt on Pinterest and thought it was cool and modern! I was looking for an idea for my next quilt which was for my daughter and her husband (they're newly weds). Your quilt was in their colors and really reflected their eclectic style. We used prints with triangles in them and some have a bit of metallic shine to them too. 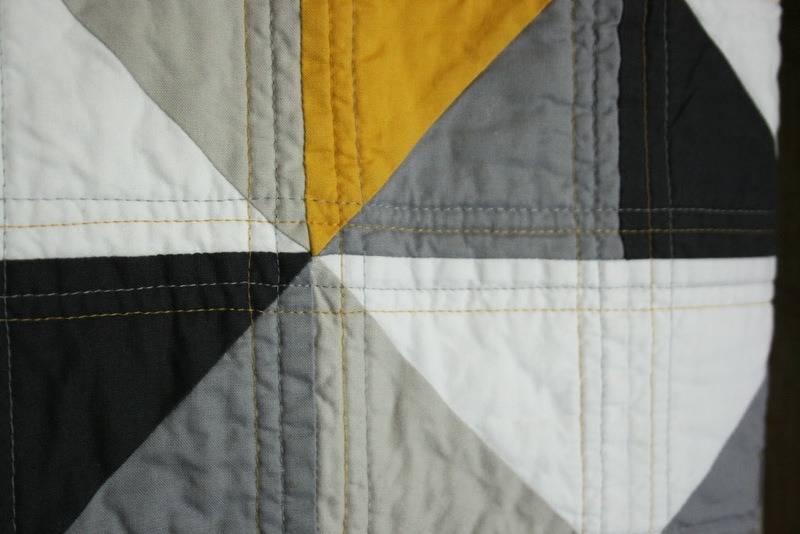 I named the quilt Trinity because of the triangles and because their marriage is based on God. The finished squares were 6" and the finished quilt is about 49"x61". The backing is a gorgeous tweed flannel. Thank you so much for sharing and inspiring! Would love to send you a picture, couldn't on this. Hello. I am new to quilting and your quilt stopped me in my tracks. I absolutely LOVE IT. I have been trying to find the pattern and ca not find it anywhere. I would love to pay for the pattern and yo make one in a king size for my husband. Can you please email me at Amounua@gmail.com? Please? Look forward to your response.